I’m gonna get right to it. Ant-Man and Wasp is better than Avengers Infinity War. Here is a comic book movie where the characters know they’re in a comic book movie and they are enjoy the crap out of themselves for it. Please go away sad, dark, comic book characters. We’ve done that. It’s played out. And frankly, No one has done it well since Christopher Nolan six years ago—see Superman. Please, for the love of all that is good and holy, let comic book movies be fun again. So thank you Antman and Wasp for being fun and silly, and freakin’ enjoying yourself. The plot is pretty simple. Sometime in 80s Janet Van Dyne with her husband Hank Pym shrink to stop a Soviet missile, but during the mission they realize that they need to go to the sub-atomic quantum realm, which is comic book talk for really really small. Anyway, apparently it is impossible to come back from being too small. So Janet Van Dyne saves the day by going really really small and shutting down the missile. Years later, Scott Lang when he steals the Antman suits goes subamotic and comes back. 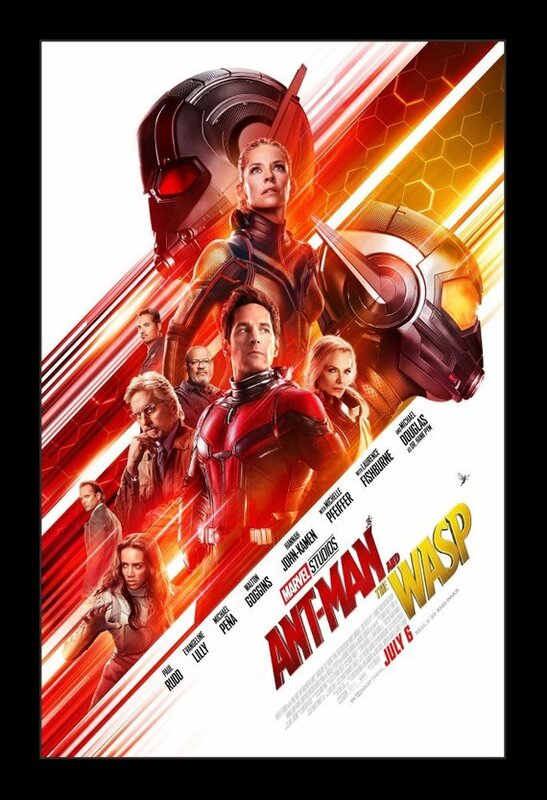 Which gives both Hank Pym and his daughter Hope Pym, hope that Janet is still alive. So they build technology to bring her back, but that technology is very valuable. 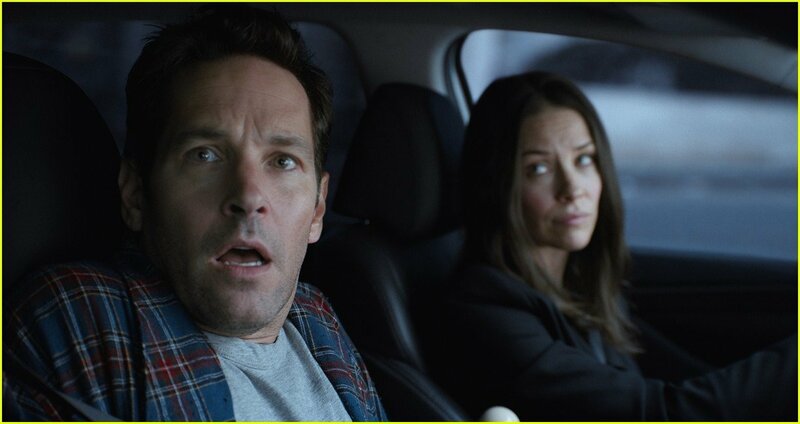 Fast forward to today where Scott Lang is for whatever reason, under house arrest for two years. Apparently, helping Captain America in an Avengers movies is worthy of house arrest, for whatever reason. The house arrest is really just a plot set-up. It gives Scott a reason to panic later when he is not in the house. Evangeline Lilly plays The Wasp and she leads the movie. She does a wonderful job in the action sequences, and holds her own against the comic timing of Paul Rudd who plays Antman. But the best scenes belong to Michael Pena, as Luis, a former cellmate of Scott, who now runs X-Con security company. We need a Luis movie. The movie is light and fun. Which is a nice change of pace from the super serious comic book movies we’ve been getting. Wait for the first ends credits scene to see how this movie connects with Avengers: Infinity War. I recommend catching this in the theater. It is very fun. This entry was posted in Movies and tagged Marvel, movie reviews, movies on August 14, 2018 by mctiller. We talk about visiting schools and getting paid to speak. We also talk about working with new indie-publishers. This entry was posted in Podcast and tagged AJ Cosmo, Hangout, Podcast on August 14, 2018 by mctiller. 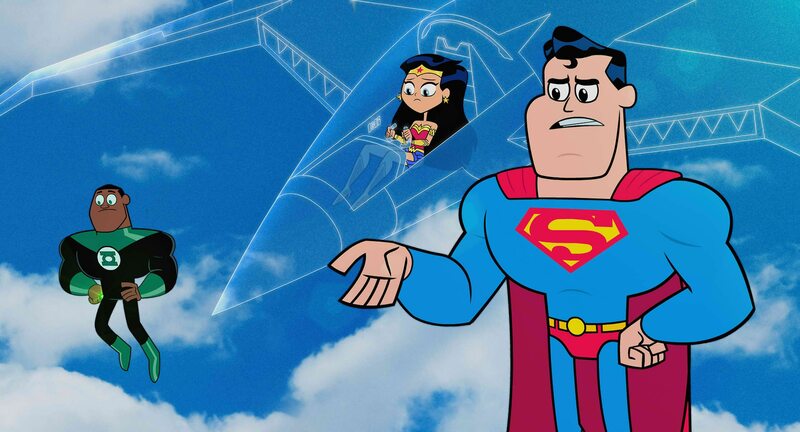 Teen Titans Go Movie–Far better than it should be or that we deserve. Teen Titans is far better than it should be, and it is the silliness is what the world needs now. Strange that I am writing that about a cartoon. But the fun and silliness fills each frame, and at times it spills out onto the audience. Several times I found myself laughing harder than my own seven year old daughter. There are numerous jokes and references for adults. Many references for adult comic book or movie geeks. It is just pure silliness. And it is wonderful. The movie opens with Balloon Man attacking the city. The Teen Titans intervene and try to stop him. They are annoyed that Balloon Man has Never heard of them. So they break out their rap theme song, get distracted and Superman, Batman, Wonder Woman, and Green Lantern have to come in and finish up the rescue. And the Teen Titans wonder why no one takes them seriously. Robin is the leader of the Teen Titans, but everyone else knows him as Batman’s sidekick and that designation is keeping him from getting his own movie. And that is all Robin wants, his own movie. (Not saving the world, or getting his parents back, but getting his own movie is the motivation that this Robin has.) Every other superhero in this universe gets their own superhero movie—even the Batmobile and Bat Utility Belt get their own movie. Robin and the Teen Titians go to see the premiere of the next Batman movie, Batman Again. And during pre-show the director Jade Wilson, voiced by Kristen Bell, comes out to introduce all the new superhero movies, and Robin is eager for his moment in the spotlight. But after trailers for Alfred, the Batmobile, and the Bat Utility Belt, Robin runs out ashamed. Robin next day heads to the set to ask Jade Wilson for his own movie, and Robin learns that he needs his own nemesis. Batman has the Joker, Superman Lex Luthor, but Robin does not have one. 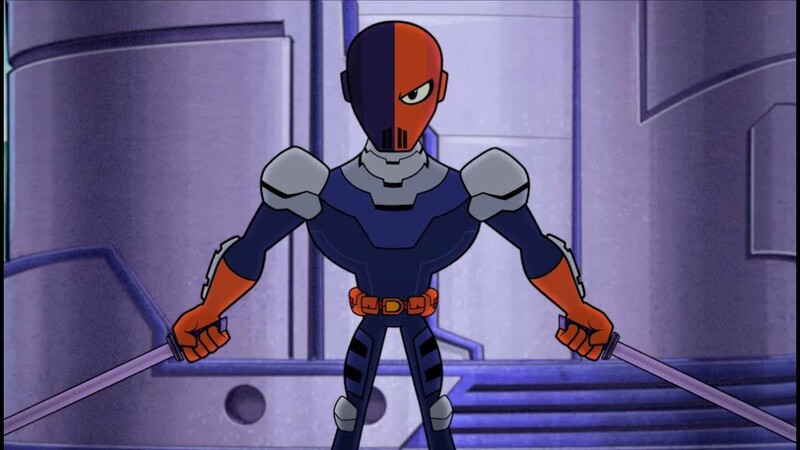 Slade looks like Deadpool, but Deadpool is in the Marvel Universe and this is the D.C. Universe. The one day Robin actually stops Slade, but it isn’t enough. Robin realizes that he needs to stop all the other superheros from ever happening. 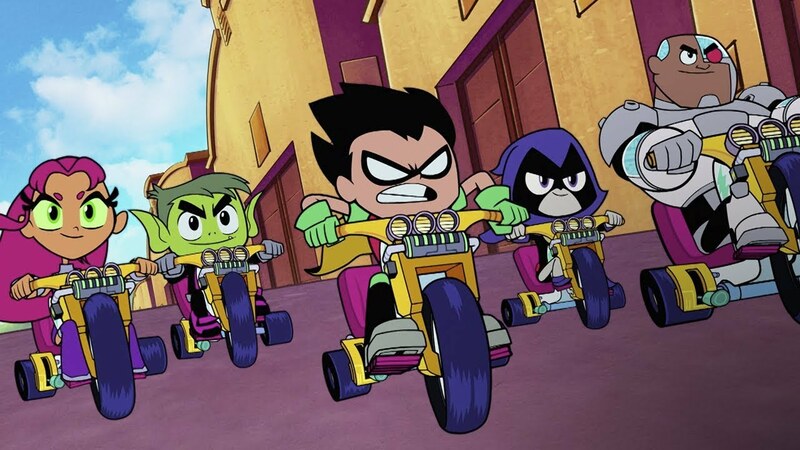 So The Teen Titans get on time traveling tricycles. Yes, time-traveling tricycles, complete with Back to the Future sound track. Nicolas Cage voices Superman, which is subtle reference to the Tim Burton, Superman movie Superman Lives that Cage was suppose to play Superman, but it never was finished. Nevermind that this is a DC property Stan Lee makes a couple of wonderful appearances. If your child watches the show, they will enjoy this movie. If you enjoy comic book movies, you will enjoy this one as it deftly skewers comic book troupes. I would recommend catching this in the theater with your kid. If not then, definitely use a Netflix disc rental on this one. 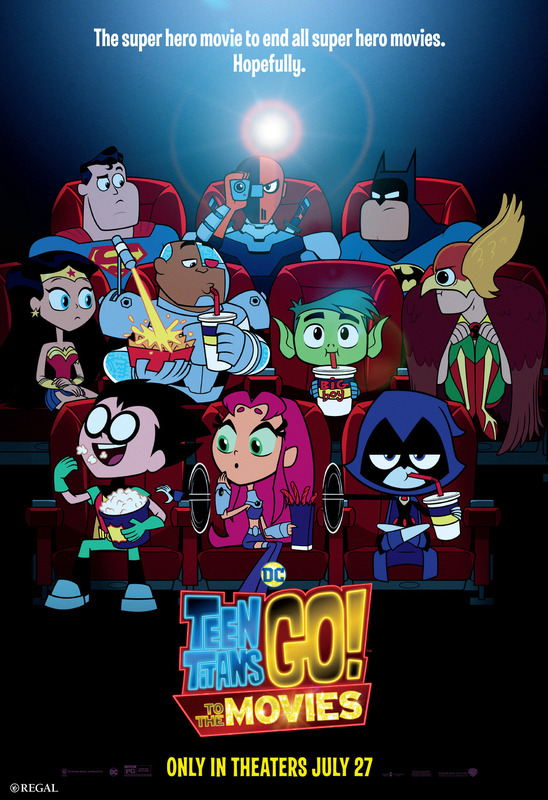 This entry was posted in Movies, Recommendations and tagged movies, reviews, Teen Titans Go on August 14, 2018 by mctiller.